Our range of products include fried gram sorting machines. 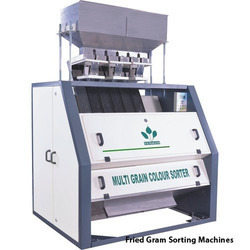 With the inclusion of advanced technical knowledge and innovative machines in all our processes, we are engaged in offering Fried Gram Sorting Machines. Its main content is the processing of the fries gram and broken is low, the sorting clean, good color, less impurity. Our provided sorting machine is manufactured by our talented professional with the usage of finest quality material & advance technology in fulfillment with the set norms of industry. This sorting machine is stringently tested on different parameters to guarantee its excellence.